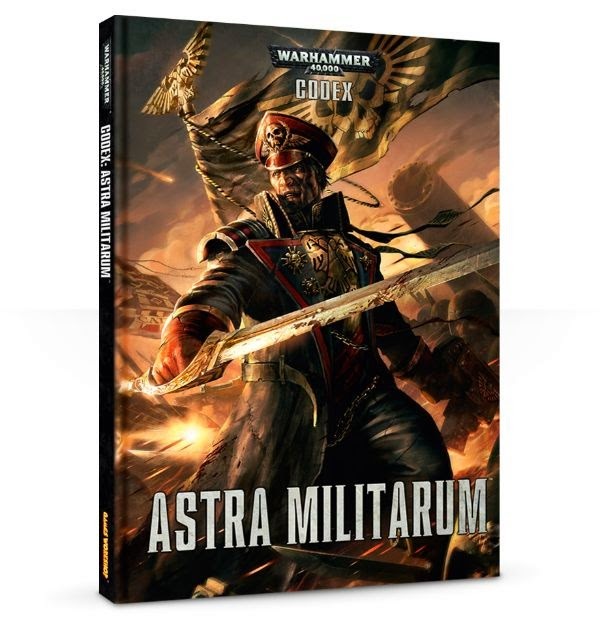 What with the recent release of the new Imperial Guard Codex i have been hearing a lot of positive reviews about the book. However i heard a more balanced review of the book from the hosts of the Jaded Gamer Cast ,a podcast that i have recently discovered and been enjoying immensely. In the episode that covers the IG release , episode 172, the hosts look at both the good aspects and bad aspects of the book and manage to deliver a very balanced review of the codex. They bought up several points that i would like to elaborate on. One point bought up early on in the episode was that there were a ton of missed opportunities in this book. Codex Space Marines allowed space marine players to take chapter traits for 7 (40k players correct me if i am wrong) different space marine chapters, allowing a huge amount of variety amongst space marine armies. Now you would think that for the imperial guard, an organization made up of thousands of unique armies, we would see a similar system allowing players to take army traits for Tanith, Death Korps and many more famous imperial guard regiments. Instead imperial guard players got none of that. They were given no variety, they have been forced to play the same army type with no nod given to the thousands of unique imperial guard regiments in 40k lore. So IG player loose powerful Artillery Pieces, Special Characters and Penal Legion squads, and get the box truck, storm trooper command squads and a mortar tank. Not really a fair trade in my book. Also the hosts of the show mentioned that the new book felt like the old book, copy pasted with a few bits cut out and upgraded for 6th ed (warlord traits and army magic times, come on its what they are). On the positive side of the aisle the Warlord traits are all good (called the best warlord trait table during the episode), with every result on the table giving you a decent benefit, Knight commander Pask is an excellent upgrade for any armour heavy Guard player, in fact the book caters to tank loving guard players in many ways one of the key ones being HQ tank commander options. At the start of the review the Imperial Guard book was called Codex Cadia, because of the utter lack of variety in terms of doctrines, effectively making every imperial guard army a Cadian army in different clothes. And if you had fond memories of 4th ed Imperial Guard, where there was a doctrine system that allowed you to pick a series of doctrines that allowed you to play armies like Tanith or the Steel Legion, then you cant help but be let down by this book. Yeah it may have upgraded the Guard to 6th ed, but it didn't do a whole lot more than that. Until next time. One of the things 40K players need to realise about "new" 40K is that your main army codex is no longer the be-all-and-end-all of your army. With the Allies rule and all the supplimental codex rules being released the variety is there and the rules are more permissive than ever before. You could add an inquistorial squad, an Imperial knight, Space Marine detachment etc etc. Of course this is generally lost on the competitive internetz scene, but think of the game as a narrative campaign and the options are awesome. The variety in the Space Marine codex was a way of getting around having to release multiple codex (codi?) for the different chapters...eg Black Templars will no longer be a seperate codex. Also how much of the above that was cut had pre-existing models from GW? that IP case is only just starting to be felt in the hobby...no GW model = no rules from GW no matter how long and traditional it has been as an option. While I agree that the current 40K landscape provides ample diversity, I can't agree that it provides depth in the case of the new IG codex. It was not all that long ago that we were provided with a single page of rules that accommodated the vast number of Space Marine players by allowing them to have chapter specific traits. Black Templars were cut, but they were not forgotten. That's the only real difference in my mind. As someone who owns a Tallarn army with Captain Al Raheem it's frustrating to now have to swallow the idea that I am just playing generic guard instead of the fluffy and interesting army I once had. Now, I am not saying that I can't pretend... this is toy soldiers after all... but the idea that one page of rules was too much to fit into a codex that already has so much cut out is silly. It's one of the thinnest released so far in 6th. With that having been said, yes. I agree that there will likely be some supplements or data slates released in the future that may resolve this (http://jadedgamercast.com/2014/04/13/weekly-listener-poll-55/) I just don't like the idea that we are at a place where that sort of release is required for depth and variety instead of just a bonus item that enriches the game. Right before the IG were released GW placed several former OOP guard squads back onto their site, notably Steel Legion, Gaunt's Ghosts, The Last Chancers ad several over recognizable guard units. This was after they were removed when the collectors edition models were removed from the site (some like the Ghosts and the Chancers went before then) so GW does still make models. And the funny thing is that GW has released Imperial Fists and Iron Hands marine supplements even after giving them chapter traits in the new marine book. So i don't know what their plan is there. Thanks for the shout out Rex!